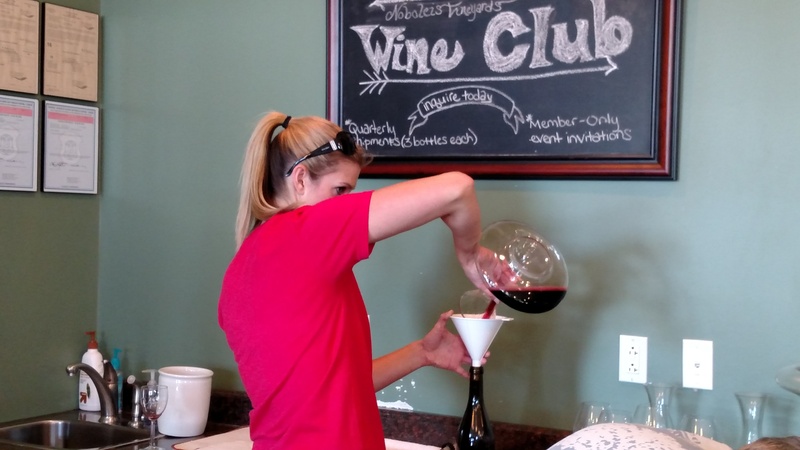 Noboleis Vineyards 5 Year Anniversary Red Blend | Wine Splash! Many things can affect your opinion when experiencing a wine for the first time. Was it the ambiance of the winery or was it the fun wine tasting hosts? Views of the rolling hills and vineyard from the winery patio were spectacular! The weather was beautiful and we were laughing, smiling, and having a great time! Maybe all that swayed our opinion of the wine? But honestly, I don’t think any outside forces could add or take away from how excellent this wine really is! Great wines can come from anywhere in the world where there is good terroir and climate, a winemaker who is passionate about making wonderful wines, and winery owners who enjoy impressing their customers. Welcome to Noboleis Winery in Augusta, Missouri where there are some wines that taste like you are somewhere over the rainbow. And on the day of their 5 year anniversary, this wine made it a real celebration! We were very lucky to have one of the Winery Managers, Megan, assist us in opening our Noboleis 5 Year Anniversary Red Blend. She poured and decanted the wine while another wine host, Dave, spent almost 10 minutes spinning and swirling the rich red liquid. Patience was our virtue and it was worth the wait because the final concoction was one to remember. This Noboleis 5 Year Anniversary Red is a blend of Norton, Chambourcin, and Cabernet Sauvignon all locally grown in Augusta, Missouri. In the glass, deep ruby red in color with a purplish hue. An intoxicating nose of chocolate, toffee, and ripe black cherry. Full bodied with teasing, yet graceful tannins across the palate. 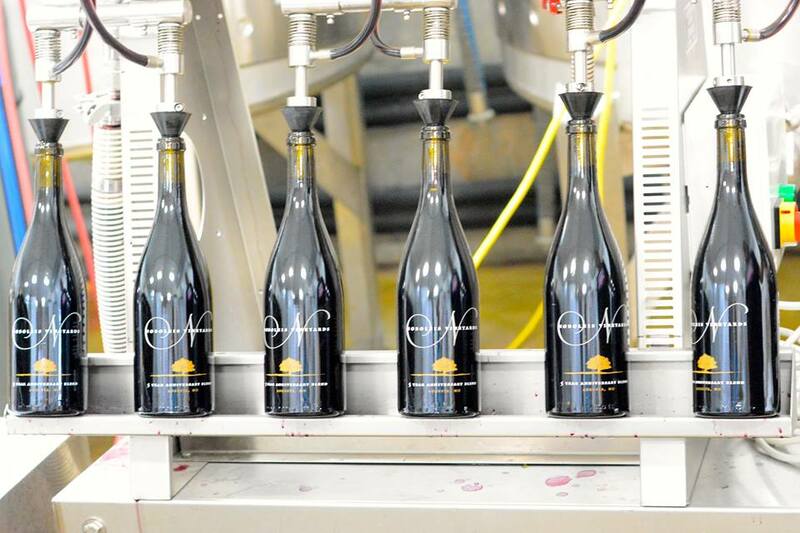 Provocative flavors of rich dark berry, cocoa, ripe raspberry, and spice! Quite avant-garde! On the second sip, flavors of black cherry, bittersweet chocolate, and smoke was more pronounced leading to a long, elegant finish. Wonderful balance and exquisite character! Pair with beef, smoked pork dishes, barbecue chicken, game birds, or pasta with a hearty tomato meat sauce. 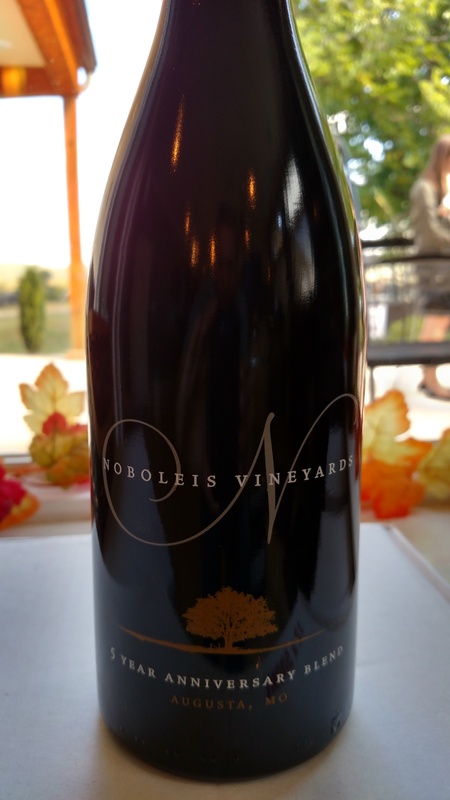 This Noboleis Vineyard 5 Year Anniversary Red Blend is truly deserving of 95 points! A wine you could drink now after a bit of decanting or lay down for another 5 years of aging. But why wait since everyday is a celebration and should be enjoyed with great wines like this! $35 a bottle average. WineSplashing! !